IKEA Canada Holiday Sale: Save 25% Off All Picture Frames! IKEA Canada has a new Holiday sale for a limited time only! Save 25% off all picture frames including the RIBBA frames collection. IKEA has a huge assortment of ready-to-hang prints, or you could frame your personal photos or artwork. With loads of frame colours and sizes to choose from, you can make your home instantly more you! This IKEA offer is valid from today, Thursday, December 22 until Monday, December 26, 2016. Valid in-store, online, Pick-up and order points and Collection Points. While supplies last. No rain checks. Selection may vary by store. Limit 20 per customer. Plus, you can see all the new items and models from IKEA Canada 2017 catalogue and flyers now on Smartcanucks.ca flyers! 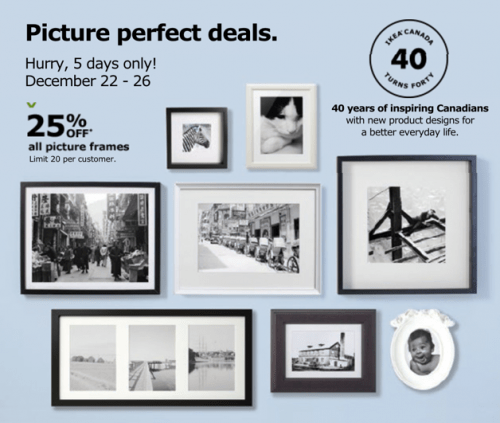 Click here to get picture frames online deal at IKEA Canada. Click here to view IKEA Canada 2017 Catalogue and flyers.